San Diego, California, USA: Helicopter trade shows are very exciting. There is anticipation preparing to attend the show, traveling to the show and to enjoying the show itself. However, the expense of attending a helicopter trade show can be overwhelming for the attendees and exhibitors. Attendees need to be able to afford the admission fee, all travel expenses and be able to take the time off from work. Also, to enjoy the show further, one needs the finances for buying gifts, souvenirs or products while at the trade show. Exhibitors spend a small fortune to have a booth at helicopter trade shows, from the expensive cost of a trade show booth, to the travel expenses for multiple employees, to design flyers and ship these, purchase trade show giveaways and ship these, to set up and tear down the booth (using employees and outside hired help), to man the booth and there are probably all sorts of other expenses at trade shows. One helicopter company told me it cost 1 million U.S. dollars just to transport their helicopter (a very large helicopter) from the USA to a helicopter trade show in the United Kingdom. I've had some other helicopter OEM's indicate that their large multi-story trade show booths are in the million dollar range. Lots of money is spent for a mere three (3) days at a trade show! With that said, exhibitors (from the owners, CEOs, marketing people, their staff), I hope would be grounded in the reality that not every key person in the helicopter industry, from pilots, mechanics, office personnel and business owners, can afford to attend helicopter trade shows! 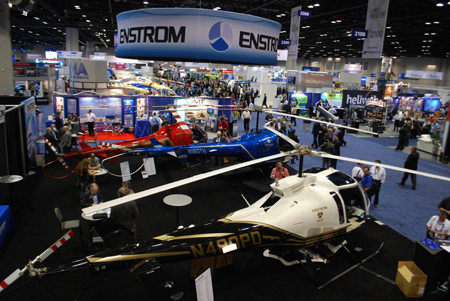 In addition, many helicopter related businesses cannot afford or justify the time and expense to have a booth at a helicopter trade show. I'll always remember the time when I met the owner of a helicopter operator company from India, who was attending Heli-Expo 2012 in Dallas, Texas, USA. I asked him if any of his employees were attending, he said he was the only person in his company who could afford to travel to the USA for Heli-Expo. He told me he simply could not pay for any of his employees to attend the trade show. Here's a business owner from India and he can't afford to send even one of his employees to Heli-Expo! I've also had several advertising clients of mine, in the USA, tell me they don't attend Heli-Expo too often because of the personal expense and they don't have a booth due to the expense as well. Don't get me wrong, I'm certainly not discounting helicopter trade shows. I'm simply saying that many people who would like to attend a helicopter trade show as an attendee or exhibitor can't afford to. I love to attend helicopter trade shows (when I can afford it) and I would always recommend that everyone as possible, in the industry or those who simply have a love of helicopters, to try to attend the helicopter trade show nearest you. Besides their drawbacks, helicopter trade shows are an excellent place to meet business colleagues, make friends, meet leaders in the industry, attend seminars, find out about older and new companies in the helicopter industry, see and touch products, ask questions to sales people, see many current helicopters, see older helicopter models as well, sit inside helicopters and if you are lucky enough — get a helicopter ride. Helicopter trade shows are really lots of fun. 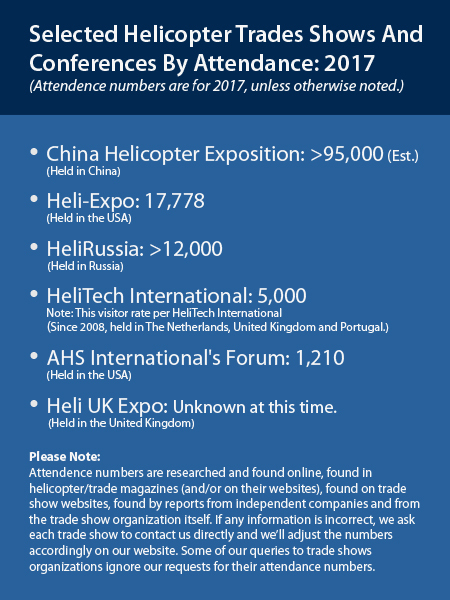 Here are some of the attendance numbers of several helicopter trade shows around the world. Reference: Helicopter Association International and news sources. If you notice above, most major helicopter trade shows last for about three (3) days. Not a lot of time to for buyers to find sellers! And the reverse. And in my opinion, many key employees in charge of purchasing, can't attend helicopter trade shows. If many buyers can't afford to attend a helicopter trade show, how can you as a seller be available to buyers around the world? If a buyer needs to find a seller, my guess is that most people go online. In 2017, Helicopter Links had a total of 58,781 visitors. Our visitors are from anywhere in the world and can search online at their own convenience 24 hours a day and year-round. In fact, about 80% of Helicopter Links visitors are from people performing a search online and typing two (2) or more search terms from the helicopter industry, such as "helicopter manufacturers", "helicopter engine repair", "helicopter trade shows", "helicopter heavy lift companies". Then, when people find Helicopter Links website, they use it to find helicopter suppliers, products and services in the helicopter industry. People who use Helicopter Links, are those who need information, researching before buying and those ready to buy. In a sense, one can say that Helicopter Links is like a worldwide helicopter trade show. The fact that anyone, at any time, and from anywhere in the world, can go online and find a supplier or service in the helicopter industry is an great value to the buyer and to the seller. The banner ads are ready for the buyer to find, when the buyer looking to spend money with a seller. And there are no entry fees! Helicopter Links advertising fees are a mere drop in the bucket when compared to the expenses a seller has to dish out at a helicopter trade show. Total Visitors means to grand total of visitors to our website, including repeat visitors, per year. Unique Visitors is counted the number of individuals who visited our website, regardless if they visited our site once or 10 times - per year. Pageviews is the grand total web pages everyone clicked on, per year. The pageviews tell us how many extra clicks were made by people going from one web page on Helicopter Links to another web page, using our site to look for more information. The more pageviews, if you are advertising our Helicopter Links website, the people will see your banner ads! These next two paragraphs are for the helicopter operators: One thing which might not be apparent to the helicopter operator is this: Helicopter Links has people from outside the helicopter industry, such as general contractors, pipeline and utility companies, fire departments, governments and other industries in need of hiring helicopter operators, visiting our website. We know this because we get emails and phone calls each month from these types of visitors. My guess is that these companies rarely if ever, attend helicopter trade shows, trying to find helicopter operators. But they certainly go online and find Helicopter Links website to find helicopter operators for hire. I've also asked some of these contractors (when they are on the phone with me) if they know, by name, of some of the big helicopter operators (which typically attend Heli-Expo) and not one of these contractors has ever heard of these companies - by name. I know personally, that Helicopter Links is useful each year, to companies outside of the helicopter industry, which are searching for helicopter operators to help them complete their jobs. 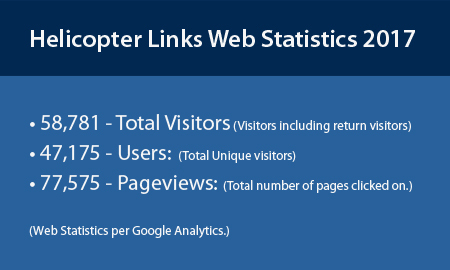 Our web statistics also tell us that many Helicopter Links' visitors are from inside the helicopter industry. Many of the major helicopter parts and engine suppliers such as BAE Systems, B/E Aerospace, Cobham, Goodrich, General Electric, General Dynamics, L-3 Communications, Raytheon Company, Rolls-Royce, Pratt and Whitney, Safran, Thales, etc.) visiting us, all the major helicopter manufactures visit our website, banks, private individuals, many different branches from governments (city, state and federal and military agencies) and oil companies (probably searching to purchase helicopters or find parts and services, for their helicopters) visit our website. From helicopter operators looking to gain new customers and jobs, to companies selling directly to helicopter operators, will benefit from advertising on Helicopter Links website because with Helicopter Links and unlike helicopter trade shows, we have visitors from both inside and outside the helicopter industry, searching to find a seller. Short duration, from 3 to 5 days. Only visitors with a budget can attend. Very expensive for the exhibitor. There is no entry fee to use Helicopter Links website. Available to anyone worldwide, 365 days per year. You can expand your customer base with local, regional, national and international customers. Visitors from both inside and outside the helicopter industry visit Helicopter Links. 80% of our visitors are from performing an online searches - using two (2) or more search terms, looking for products and services, and then they find Helicopter Links website. People are using Helicopter Links for the same reason why buyers use Amazon and eBay. They are buyers searching for sellers, either researching before buying or ready to buy. Your return on investment with Helicopter Links is allowing you to advertising, market and brand your company directly to the buyers in the helicopter industry. Buyers can find your company and then your employees have the leads they need to make the sale! For more information about our advertising options and rates, please call or email us at +1 (858) 413-7074 or staff@helicopterlinks.com. Helicopter Links is located in San Diego, California, USA.